Did someone just say “fluoro diving”? With colour runs, fluoro yoga, and festivals such as vivid Sydney becoming more popular than ever, it seems that “bright colours” are the new “black”. Well, guess what fellow explorers: one the best fluoro displays you will ever find is brought to you by…nature itself! More precisely, by the underwater world. And no, it is not about going diving in a brightly coloured wetsuit, it is something much more exciting than that! Fluorescence night diving, also called UV, fluoro or glow diving is a night dive during which special equipment is used to bring out the glow of the underwater world. With the help of a blue torch and a yellow filter fitted to your mask, the ocean lights up like a night club, turning it into a magical world of neon colours beyond your imagination. In a similar way that black light or UV light make light colours and white pop out, the blue light used in fluoro diving equipment brings out the vibrant colours reflected by certain proteins in living organisms. 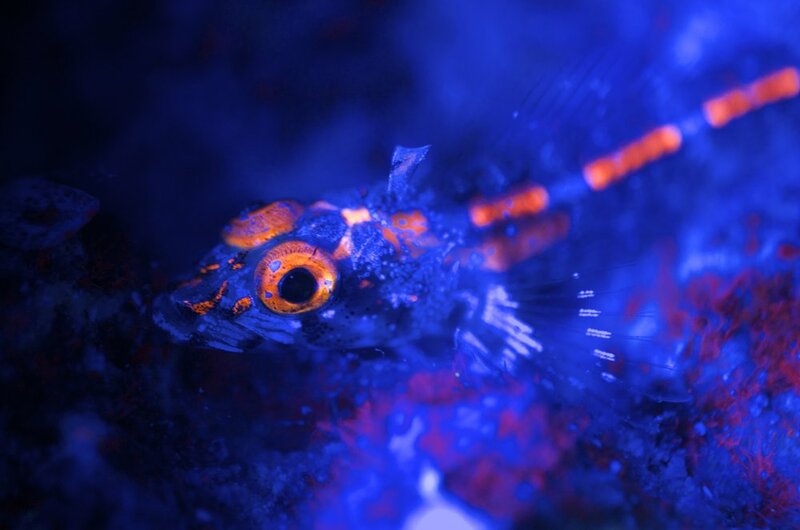 Coral, invertebrates, and even some fish, will literally shine in a new light. They become bright green, yellow, red, purple, pink or blue and it is very impressive. I found out about this when I saw footage of a fluoro dive in Bali. A couple years ago, I finally got a trip organised to the Great Barrier Reef and I was lucky enough to see coral spawning on my first fluoro dive which was an incredible experience! Scientists have known about the fluorescent properties of coral and marine creatures since the late 1920’s. They have a good understanding about how it works (different wave lengths of light bring out different colours), but no one really seems to know why living organisms produce such colours, or what role it plays in the ecosystem. Although a lot is yet to be understood about the phenomenon, there are already a few practical applications beyond the pure enjoyment of night divers. Fluorescent properties are for example being used to assess the health of the reef as fluoro lights can reveal the early onsets of coral bleaching, or show the extent of destructive algae contamination. Fluoro diving is not harmful in any way (to humans, fish, or coral), but it is only open to divers who have significant night dive experience as well as solid underwater orientation skills. It is indeed very easy to get disoriented, and hanging out at night in the ocean with hardly any light can be quite daunting for some. I would however recommend it in a heartbeat! Few operators offer fluoro night dives around the world, but if you live in Australia, you are in luck! One of the operators: Divers Den is located nowhere else than in beautiful, sunny Cairns and organises liveaboard trips to the Great Barrier Reef daily. For those of you based on the West Coast, there is also another operator there: Perth Scuba. So, what are you waiting for to make the most of what our underwater world has to offer?